Young Guns, Boston Bruins 2000-01! Welcome to my Boston Bruins Young Guns page. I'm really stoked for the up-coming season, the Bruins have stock piled some young Guns. Guys up front banging like Joe Thornton, Jason Allison, Anson Carter and Cameron Mann. A solid defensive corp is led by Bad Kyle Mclaren.Here is a preview of some of the new kids on the block, coming to Ristuccia this summer. Let me know what you think about this season: drop me a line at shannon66@yahoo.com. A strong skater and a hard one to knock off his skates. Pahlsson doesn't fret going into the boards were the pucks at, because when he has he's a wonder on the ice. With his creative puck handling and strong passing ability Pahlsson is a danger at all times. Grahame will lead the way, Dafoe has had his day! John Grahame is the Bruisn goalie of the future. He is not the one that rejected a 3 mil per year contract in July, sat out until late October for 3.1 mil, and then showed up out of shape and blew the 99-2000 season. No that was "Lord"? Byron, and he showed us what he is made of last year. 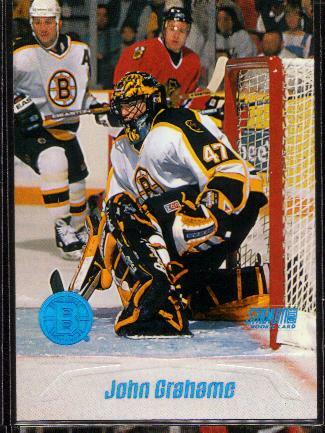 He is in the Bruins past, like John Casey. Grahame is currently 8-0 in the AHL playoffs, the same ones that he single handedly won last year. John Grahame, a proven champion. Not only in Providence, but in college he hoisted the cup. Soon to be seen hoisting the cup at the Fleet. Ask any NHL Head Coach or General Manager if he would like to have a 6'5/245lbs. rugged defenceman for his blueline corps and you will certainly get his undivided attention immediately. The Bruins have this psycho, an absolute hard skating brick wall to go with Bad Kyle Mclaren 'Big Mac' and his twin tower Hal Gill. GNN= good night now to the Eastern Conference forwards. 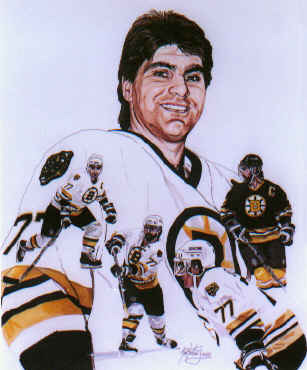 Just ask Lindros how hard the B's D hits! The Rock may need to start the season in Providence. Assets: Size and strength. Nasty competitor who can move the puck out of his team�s zone. Has a 100mph shot and the ability to support the attack. Hard to move and knock of skates. PROVIDENCE, R.I. - The University of North Dakota put the Western Collegiate Hockey Association back on top of the college hockey world here Saturday night as senior forwards Lee Goren and Jason Ulmer combined to score three goals in the third period to lead the Fighting Sioux to a thrilling 4-2 come-from-behind victory over Boston College in the 2000 NCAA Div. 1 Ice Hockey Championship game played before a sellout crowd of 11,484 at the Providence Civic Center. North Dakota trailed 2-1 heading into the final 20 minutes, but took over the contest with the teams playing 5-on-5 throughout the last period. Senior winger Lee Goren, who wound up as college hockey's goal-scoring champion after his two tallies tonight gave him 34 on the season, knotted the score at 2-2 just 2:43 into the third when he beat BC goalkeeper Scott Clemmensen off a feed from linemate Ryan Bayda. That goal seemed to re-energize the Fighting Sioux, who wound up outshooting the Eagles by an 11-4 margin in the third period and by a 36-23 margin on the night. After Goren's first goal of the game evened the score, linemate and centerman Jason Ulmer then coverted a pass from Goren at 14:22 for his 18th goal on the season to give North Dakota the lead for the first time in the game since UND defenseman Mike Commodore had opened the scoring in the first period at 3:48. With the Sioux up 3-2 and the clock showing just 1:13 to play, BC pulled Clemmensen for an extra attacker but the strategy backfired when Goren again came up big with an unassisted empty-net goal at 19:14 to seal the victory. 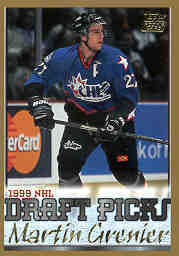 Four North Dakota players were named to the 2000 NCAA Frozen Four All-Tournament Team, led by winger Lee Goren, who also earned the Most Outstanding Player honor. The other three named were sophomore forward Bryan Lundbohm, junior defenseman Mike Commodore, and junior goaltender Karl Goehring. Two Boston College players - forward Jeff Farkas and defenseman Mike Mottau - rounded out this year's NCAA All-Tournament Team. 1st: G1 UND - Mike Commodore 5 (Bryan Lundbohm, Tim Skarperud), 3:48; G2 BC - Jeff Farkas 32 (Blake Bellefeuille, Brian Gionta), PPG, 16:47. 2nd: G3 BC - Marty Hughes 5 (Gionta), 6:59. 3rd: G4 UND - Lee Goren 33 (Ryan Bayda), 2:43; G5 UND - Jason Ulmer 18 (Goren), 14:22; G6 UND - Goren 34 (unassisted), ENG, 19:14. Score by Periods: UND 1-0-3 = 4; BC 1-1-0 = 2. Pen: UND 7-14; BC 4-8. PPs: UND 0-3; BC 1-6. Saves: Karl Goehring (UND), 12-5-4 = 21 (60:00); Scott Clemmensen (BC), 12-12-8 = 32 (58:47). Lee Goren has size, but prefers to play more of a finesse game. He's not a power forward in the conventional sense, but reminds some scouts of a young Dave Andreychuk the way he positions himself out front and does not quit on the puck until it is in the net. Because he has a large frame, he is difficult to move and Goren has some very sweet hands, whether shooting or tipping shots for goals. In the 1999 NCAA Tournament, Goren scored the final goal in UND's season in a loss to Boston College in memorable fashion as he drilled a shot up under the crossbar with a defender draped all over him. He has demonstrated a strong work ethic in college and should be able to make it to the next level given he is willing to work. Goren gained a measure of revenge against Boston College with his herculean effort in the third period of the 2000 NCAA Championship Game. Expect big things, 20-30 goals from the big rookie right wing. I'd like to see him on a line with Thornton and Samsonov.